Free Study Guides! - "Abiding in Christ"
We also have Free Audio Studies and Free Victory Videos that will help you grow in Christ! You may need Adobe Reader to open and print our Study Guides. If you need Adobe Reader: Click here for a free download. We suggest that you only download Adobe Reader and not all the "extras" they offer. Email your friends - Bless your friends! Let them know about these free Study Guides. Please take a moment to send emails to your friends around the world. 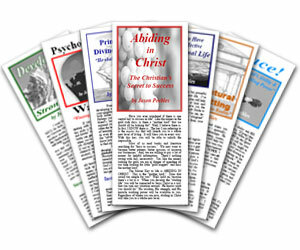 Simply copy and paste this link in your emails: www.WorldOutreach.org/abide. Start a Bible Study Group using our Study Guides - Click Here for a Fact Sheet on how to get started. You can easily print copies of our studies for everyone in your group. Simply open the “Personal Size” format and print to regular size copy paper. Permission - You have our permission to use these Study Guides for your own purposes. Email them, print them, copy them, and teach from them. Our desire is that these studies will bless believers and leaders worldwide. We have also provided the "plates" that any print shop can use to reprint these studies. We have reports that our Study Guides are in circulation around the world. Email your friends now. Sow Seed! - Your support will directly help our Mission Agency. If these Study Guides encourage you, then plant a seed! Online Donations can be made from anywhere in the world (our system processes USA & International credit cards). Make an Online Donation to help our Missionary Agency. Thank You!